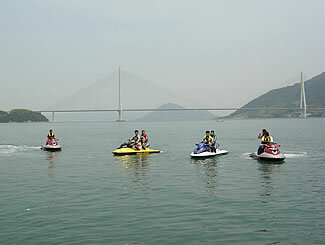 Standing in front of the Seto Inland Sea, don't you feel you'd love to cruise around the islands? The motorboats and the PWC's can definitely help you to make your dreams come true. Until the PWC came out 15 years ago, the boat was the only choice people had. Also, the PWC was seen as just a water-toy available for rides around beaches. But due to its high efficiency and the recent increase in trust, young people have become attracted to its exciting speed, reasonable price (compared to the boats) and its cool style, making it one of the top summer-sports pastimes. 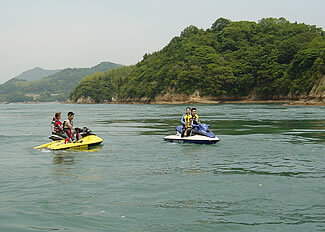 In Japan, a license is required for all boats with engines stronger than 5 PS. Around the Seto Inland Sea area, although sailing is allowed only within 5 sea miles from the coast for normal motorboat license holders and within 2 sea miles for PWC license holders, we can follow the coastline or sail around the islands to enjoy almost unlimited access. Those dreams we have standing on the beach come true here! Safety should always be considered - the upsurge in popularity also brings with it increased risk - both to body and the environment. The sea poses a different set of problems than the land! Whereas an accident on land usually results in quick recovery, the ocean is a different situation - if you get into trouble, you need to be found. Responsibility for yourself is paramount, and in the middle of the sea there are no road signs! One recent project in the Seto Inland Sea is a Sea Station (umi no eki ), designed as an information center where beach-goers or sailors can exchange useful information, hang out, rest and so on. In its initial stages right now, it attracts mainly boaters - but the organizers hope this will change, and the center will be accessible to all, providing a great place to meet like-minded sea-lovers of every kind! The Seto Inland Sea is special - full of history, culture, breath-taking scenery and amazing hospitality! Why not find the sailor within you, and we promise a wonderful world. Imagine - instead of standing on the beach looking at the ocean, how it would be to see the land from the sea…..? If you keep a boat in Japan, is has to be registered- find out all about it here.